Swift Vogue – What is a Dealer Special? We introduced the Swift Vogue into our product portfolio in 2017. It was a tremendous success, the only problem being that we sold out very early in the season which left a number of customers disappointed. For 2018 the Vogue has had a slight redesign and we’ve increased the production to satisfy customer demand. But what exactly is a dealer special? 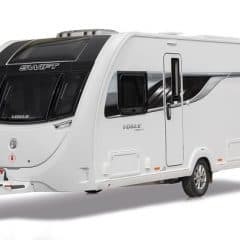 The Vogue is the Swindon Caravans Group’s dealer special and therefore can only be purchased from our dealership (other dealerships will of course have their own dealer specials). A dealer special uses a base model (in the Vogue’s case a standard Sprite caravan) and then the respective dealerships’ add certain specification to that base model in order to increase its appeal, essentially making that caravan unique. So what makes the Vogue unique? The soft furnishings, curtains and fabrics as well as the name all make the Vogue unique. The caravan is based on a Sprite but has specification over and above the standard Sprite product. As a group, we also decided that the Vogue should include Automatic Trailer Control (ATC), a 100W solar panel, a 230V external mains socket, an external BBQ point, window blinds, an alarm and an external access door, all of which make the Vogue unique. It is hard to argue against! The Swift Vogue costs £349 more than a standard Sprite. And yet the Vogue has a range of exclusive features worth £2,500 over and above what the standard Sprite range offers. Why buy the standard Sprite when you can buy the Swift Vogue? There are 6 layouts available, prices start from £17,284. Please have a look at our stock and prices or give our sales teams a call today to book an appointment to come and view. Following on from part one of our ‘Caravan Service’ series – Caravan Servicing at Swindon Caravans Group – Part 1, Dan Trudgian sat down with John Hosking, who heads up the Aftersales team at our Swindon branch, to run through some frequently asked questions. Why bother with a Caravan Service? Note: All new and used caravans that hold a warranty require an annual service. Please ensure that the yearly service is completed before the anniversary of the purchase date to avoid invalidating the warranty. Should I empty my caravan before the service? This can depend on the type of caravan service that is being carried out. But for all services, John asks customers to ensure a walkway is free so our engineers are able to walk through the van with ease. Remove all personal possessions and remove large items out of the van. What we will say is remember that damp test in part one!?! Which brand of caravan do the Swindon Caravan Group Service? We sell a range of different brands from our used stock. Please remember that if we sell a caravan then we will service it. 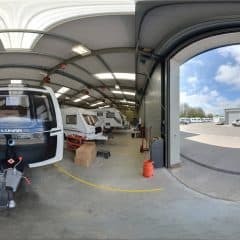 Unfortunately, due to capacity limitations in our workshop and our need to concentrate on customers who purchase caravans from us, we are not able to do any servicing & warranty work on your caravan if it has not been purchased from us. You will need to refer any warranty to your supplying dealer. How long does a caravan service take to complete? A caravan service will take between 2 and 4 hours to complete, depending on the type of service selected. Usually, we will load the yard on a Saturday and carry out services Monday to Friday the following week. All customers will receive a phone call when their service is complete. If you need your caravan service within a specific timeframe, please speak with the office at the time of booking. Will gas appliances be serviced? A gas safety check is completed on all gas appliances. A printout of results is provided with your service forms. Proof of this safety check will be required for insurance purposes. What is the main difference between a standard and premier service? A standard caravan service covers all safety and chassis checks and is better suited to those who use their caravan regularly. Need their caravan checked at the beginning of the year. All information regarding our servicing packages can be found here>> Caravan Service Information. 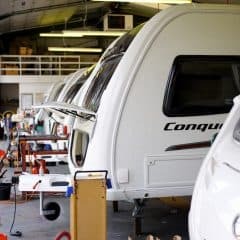 Note: Both the standard and premier service will cover your caravan for the full manufacturer’s warranty. Let us know what you think and fill out our enquiry form below along with what other topics you would like to see covered in our caravan video series. We aim to provide you with a video hub filled with tips, maintenance and serving know-how to ensure you get the best out of your caravan. Why not subscribe to our newsletter? Or stay up to date by following us on Facebook. 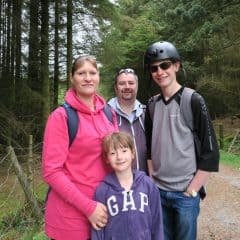 At Swindon Caravan Group it is fair to say that a healthy proportion of enquiries received relate to caravan servicing. So, when Dan Trudgian approached us about a behind the scenes vlog covering a service in detail, naturally we agreed; keen to shed as much light as possible on the caravan servicing process. In this video ‘Caravan Servicing Part One’ you’ll see behind the scenes footage of a ‘basic caravan service’ completed in June 2017. And while this is a basic service, all information regarding our other caravan servicing packages can be found here > Services <. We also thought you may want to also view our full-service checklist, which you can do so here > service checklist <. Note: Both servicing levels offered will cover your caravan for the full manufacturer’s warranty. Book in with the Aftersales team and complete any required paperwork. Your caravan will be checked over, so any existing imperfections (dinks, dents, scratches, etc.) are documented in a pre-service report. Both parties sign this before the service begins. The spindle is degreased, the hub replaced, and a brand new single use nut is fitted to the specified torque. At the end of the service when the caravan is lowered to the floor, locking wheel nuts are torqued up to the required spec. This is always double checked and signed off accordingly. Tread, depth, & date checked. Wheel carrier greased & cleaned. New copper grease applied to nuts. Full visual check – Any faults at this time are documented. Markers, brake lights and rear lights all checked. Thorough damp test inc cupboard & lockers. NOTE: Make sure cupboards and lockers are empty. At the end of the service, a full-service report will be issued. Looking for more detail on caravan servicing? Keep an eye out for ‘Caravan Servicing Part Two’ in which our Aftersales Manager John will be answering frequently asked questions regarding caravan servicing, put to him by Dan. Let us know by filling out our enquiry form below along with what other topics you would like to see covered in our caravan videos. Our goal is to provide you with a video hub filled with tips, maintenance and serving know-how to ensure you get the best out of your caravan. Do you enjoy the great outdoors as much as we do? If so, owning a caravan is one of the greatest investments you can make. However, it may seem a daunting process if you’re unsure of where to start. That is where our Swindon Caravan Group Meets The Trugians new caravan video series can help! 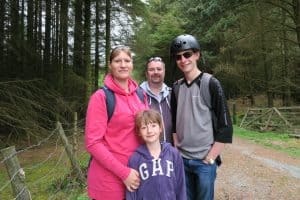 We purchased our caravan from Swindon Caravan Group back in 2014. As complete novices we were educated about every aspect of our caravanning. I hope that we can continue to inspire newcomers, veteran caravaners and those who are just curious to caravanning, by sharing our gained knowledge with the backing and resources of Swindon Caravan Group. We have a lot of videos and articles planned for the future and, it’s great to have the perspective and knowledge from a well established and respected dealership. Let us know by filling out our enquiry form below along with what other topics you would like to see covered in our caravan videos. Our aim is that every month we will provide you with a video filled with tips, maintenance and serving know-how and more to ensure you get the best out of your Caravan. So you don’t miss it why not subscribe to our newsletter, and we will email each one out to you, or follow us on Facebook.